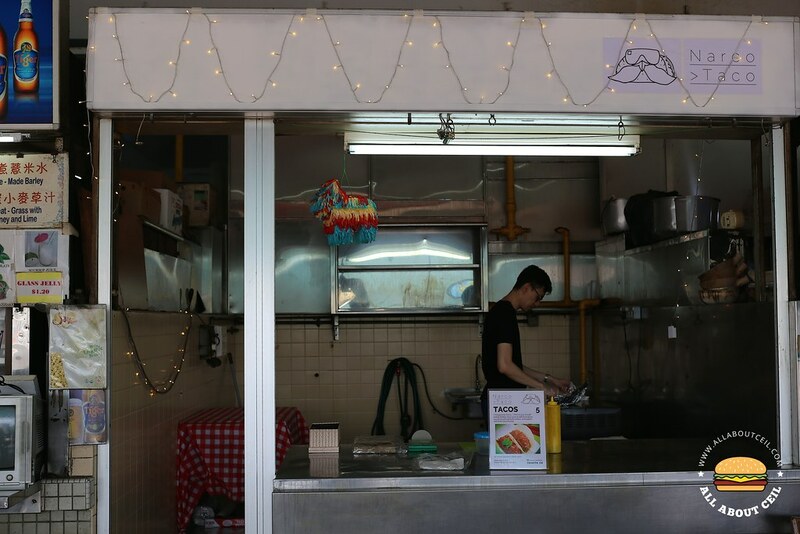 Sean, the owner, started a stall to serve taco in the food centre at Beauty World Centre. 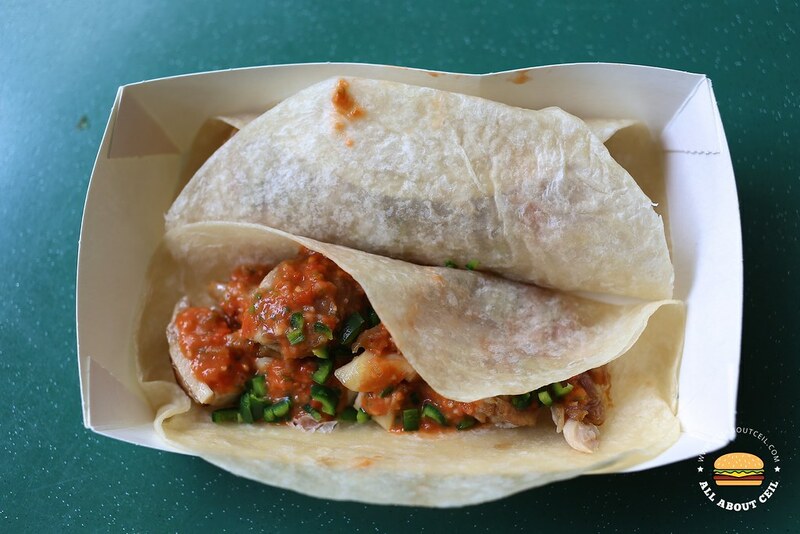 He is not serving the usual Tex-Mex (Texas-Mexico) but what he has created that is based on his very own recipe, he called it Singa-Mex (Singapore-Mexico) taco. 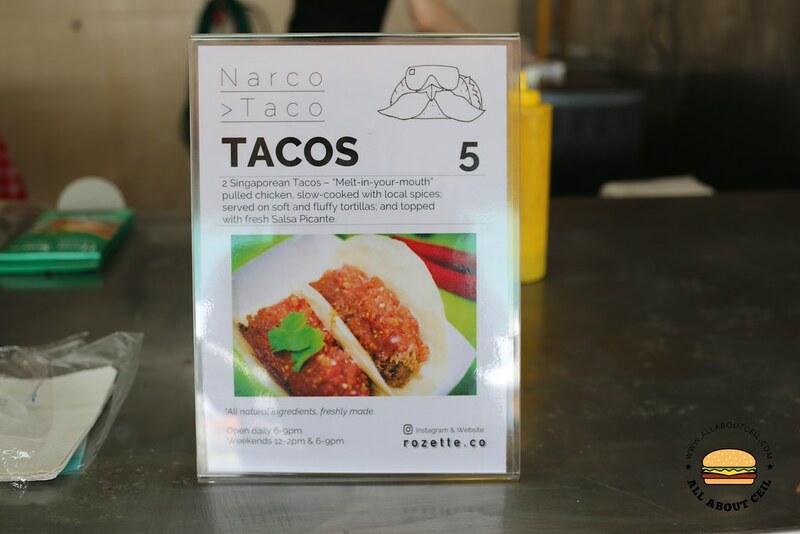 His stall stood out amongst the others, he kept it really simple, it does not even have a proper signboard but a piece of printed paper that displayed a logo and 'Narco Taco' on it, together with some lightings. I happened to walk past and was standing in front of the poster that is inserted in a clear plastic holder and prominently displayed right in front of the stall. Sean quickly walked to the front at the very moment when he spotted me. He is bespectacled, rather tall with a scholarly look and is soft-spoken. He told me that he is in his early 30s. I asked, "Is this the only thing that is on the menu?" He replied, 'Yes. It is Chicken Tacos.". Then I said, "I shall have the Chicken Tacos then". 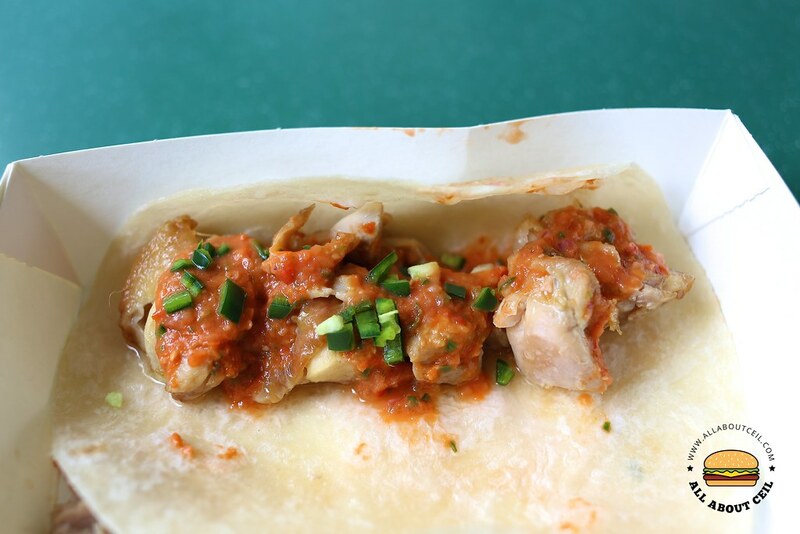 It is served in a pair for just $5 and he called it the 'Singaporean Tacos". It is stated as part of the description that it consists 'melt in your mouth pulled chicken that has been slow-cooked with local spices and is served on soft and fluffy tortillas and topped with fresh Salsa Picante'. And, I asked further, "This food centre is closing down. Are you moving to elsewhere?". He replied that there is no intention to relocate. I continued to ask, "Why did you pick this location since it is about to close down?". He answered, "I am waiting to start a new job." When I was about to walk away with my tacos, he said, "Hope you will like it." Apart from the tortillas, everything else is freshly handmade daily. The tacos were served with chicken chunks and not pulled chicken as indicated in the description, it was topped with bits of green pepper with the Salsa Picante. Though not particularly impressive but the effort in creating it is worth commendable. Do take note that they will only be open until 10 February 2017, just another couple of days more before they cease to operate. The food centre is undergoing an extensive upgrading to convert into an air-conditioned food court.